Paul Smith has taken candy stripes almost as far as someone can. 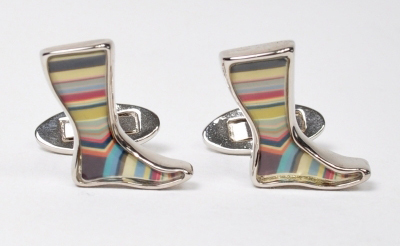 Famous for his multicoloured stripes, these cufflinks take us back to Smith’s beginnings of fun loving socks. These metallic and enamel accessories will add a touch of flavour to your suit and allow you to quietly tip your hat to a fine British fashion house. Available online. This entry was posted in Accessories, Cufflinks and tagged Paul Smith. Bookmark the permalink.